Here are most fun things to do in Miami with kids and family on vacation! You can decide to venture into one of the neighboring national parks like the Everglades and Biscayne or take a more leisurely approach on a Segway through South Beach. 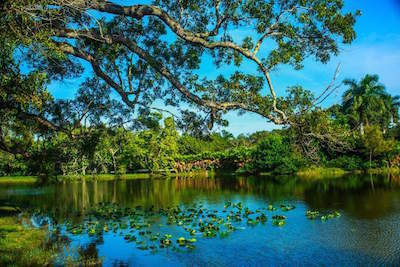 There are several incredible nature parks such as Jungle Island, Zoo Miami and Monkey Jungle. If you like culture then a trip to Little Havana or the Vizcaya Museum and Gardens will suit your fancy. Superb artwork can be found at Wynwood Walls which is just moments from the Art Deco Historic District of South Beach. Families will enjoy a horseback ride at the Jesse Williams Ranch or learning about recusing exotic animals at the Safari Edventure and you can spend the day at the Miami Seaquarium where you can swim with dolphins, seals and even penguins. 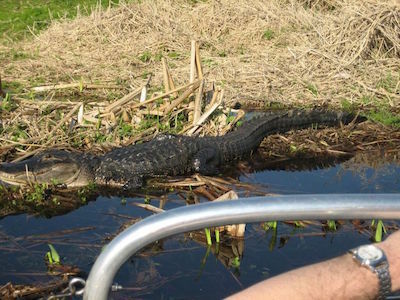 If you want your family to experience some of the United States last remaining large parcel of wetlands, then the only thing to do in Miami with kids is to plan a trip to Everglades National Park. Located south-southeast of Miami, everglades National Park is situated within 1.5 million-acres of wetlands and protects the last 20% of Florida's wetland. You will be amazed at the diversity of the River of Grass and wonder why people just visit to see alligators. Within the park there are numerous hiking trails, kayaking routes, camp grounds, bicycling and even opportunities to take the family on an airboat ride. The wildlife in Everglades National Park is abundant and diverse with bald eagles, manatees, ospreys and even bottle-nose dolphin. You can spend the day enjoying the view of the mangroves from a hardwood hammock or take a tour bus through Shark Valley and there are airboat excursions that offer guided nature hikes. The visitor's centers are a treat for families with numerous interactive exhibits about the area and eco-system which include both land and water animals. Whether you are interested in viewing wildlife or the area's eco-system, Everglades National Park is an ideal trip for all families. One of the top things to do in Miami with kids for families that like the outdoors and the underwater world is to visit Biscayne National Park. Located off of Southwest 328th Street in Homestead, Florida, Biscayne National Park is situated on 181,500-acres which are mostly underwater. There are 44 islands that comprise Biscayne National Park with only a few of them accessible to the public. The real joy at this national Park is the glorious underwater world that is a haven for snorkelers and scuba diving. Once at Biscayne National Park there is a plethora of activities that range from boating to camping to swimming. 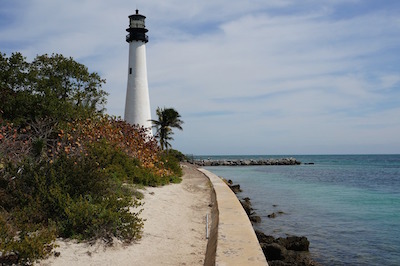 Some of the islands that are open to the public like Long Elliot Key have superb hiking, camping as well as picnic facilities and smaller islands like Boca Chita Key boasts the second largest lighthouse in the U.S. Once you enter the water you will understand just how beautiful this underwater world haven is with thousands of tropical fish and brightly colored coral reefs. If your family is not interested in snorkeling or scuba diving, then try the glass-bottom boat ride which allows for excellent viewing in a relaxed atmosphere for all ages. When you want to have the family learn about the incredible marine life that exists around the world, then the perfect thing to do in Miami with Kids is to visit the Miami Seaquarium. Located on the Rickenbacker Causeway while you are in route to Key Biscayne, the Miami Seaquarium is situated on 38-acres of simulated ocean conditions which are ideal for the park's inhabitants. While you spend time at the Miami Seaquarium you will be thrilled by the number of attractions and activities you can participate in and watch. You can have animal encounters with penguins, dolphins and seals as well as an interesting shark encounter with specialized underwater breathing gear. 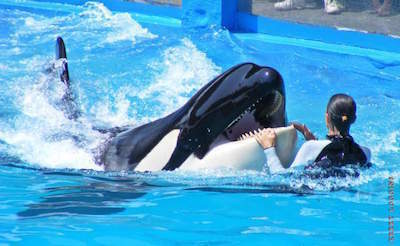 Regular shows you can watch include killer whales, seals as well as several dolphin performances throughout the day. Exhibits onsite are wonderful with Penguin Island, the Shark Channel, Tropical Reef and the Manatees pays homage to these superb marine animals. There is a Tropical Fish Aquarium, Sea Lion and Sea Den and Discovery Bay is dedicated to rescuing turtles. You will see a Stingray exhibit, crocodiles and even an aviary exhibit with numerous parrots. But that's not all with a playground and an aerial obstacle course, this place is perfect for families. When you just need to take the family to the best jungle atmosphere in Miami, then the only thing to do in Miami with kids is to plan a trip to Jungle Island. Located on Parrot Jungle Trail within Watson Island, Jungle Island is situated on 18-acres of lush tropical landscape and features a number of exhibits that are packed with exotic birds and animals. Jungle Island is a wonderland of macaws, cockatoos, parrots and flamingos which fly effortlessly within the outdoor aviaries. You might think that Jungle Island is just for the birds but once you are inside you will be thrilled with the various exhibit which include the Manu Encounter which sports squirrel monkeys, lemurs as well as a variety of macaws and the Orangutan School boasts a pair of fun loving fraternal twins. You can catch the Kangaroos Konnection, the Petting Barn and the Everglades Habitat and Walk is a spectacular learning lesson of the local eco-system. You will also view tigers, snakes and a massive 20-foot crocodile as well as a unique penguin colony that resides within Jungle Island. If that's not enough you can have the kids blow some energy off at the playground before calling your trip to Jungle Island a success. Families with like the vibrant colors and beautiful street art that has become known as Wynwood Walls and visiting this place is a great thing to do in Miami with kids. 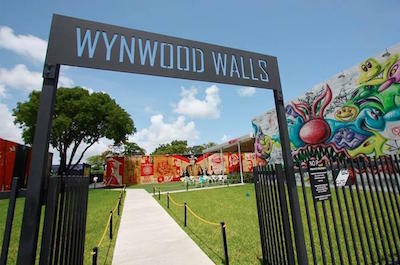 Located on Northwest 2nd Avenue just minutes from South Beach, the Wynwood Walls was created Goldman Properties in 2009 to help bring a blighted area of warehouses back into a viable set of assets to the city. The Wynwood Walls showcase the local street art talent that exists and has flourished in the city of Miami as well as the South Beach area. This outdoor art exhibit is spectacular and highlights over 50 artists and sprawls some 80,000 square feet of walls. Artists from 16 different countries have contributed to beautiful work that is on display in a unique garden landscape which features lots of green space to enhance the beauty of the art. The outdoor space is also used on a regular basis for lectures and workshops that help foster new and upcoming artists. The space incorporates a small shop where prints and books related to Wynwood Walls is sold as wthings-to-do-in-miami-beach.htmlell as the Wynwood Kitchen and Bar for people to enjoy the freshest of flavors that Miami has to offer in cuisine. 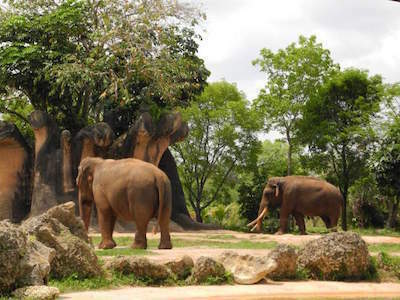 The Zoo Miami has been constantly rated over the years as one of the top ten zoos in the U.S. and is one of the more popular things to do in Miami with kids. Located on Southwest 152nd Street in southwest Miami Dade County, the Zoo Miami is situated on 340-acres and is the largest as well as oldest zoo in the state of Florida. Zoo Miami contains over 3,000 animals from 800 different species in several fascinating habitats that truly make the animals feel like they are within their own natural surroundings. The Zoo Miami boasts a wide variety of activities inside the gardens such as a Giraffe feeding station, a rhino encounter experience, the birds of Asia and Australia, a children's zoo area as well as areas dedicated to the Amazon as well as Asian rivers. There are also several playgrounds for children to enjoy as well as water play areas to combat the heat. 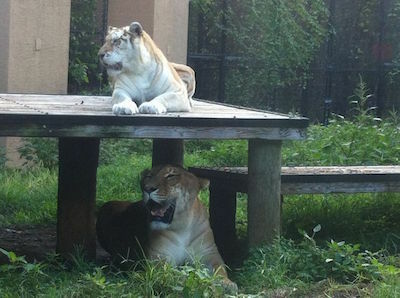 You can take your own picnic into the Zoo Miami or enjoy something from one of the numerous food courts that exist. Photo by ach_RedGold&Green Foll on Flickr. One of the most picturesque settings in all of the Magic City is the Vizcaya Museum and Gardens and is a great thing to do in Miami with kids. 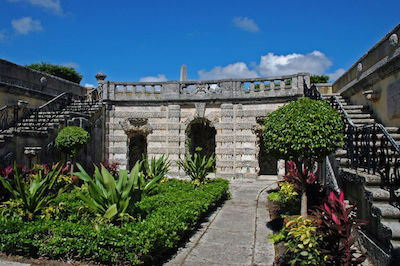 Located on South Miami Avenue in Coconut Grove, the Vizcaya Museum and Gardens are situated overlooking the Biscayne Bay. Constructed in 1916 the Vizcaya Palace is loaded with intricate decorative arts, furniture, tapestries and paintings from the 15th to 19th century. This Renaissance-style villa is beautifully detailed with manicured grounds that include spectacular gardens which feature numerous sculptures, fountains, incredible pools of water which is highlighted by several canals and walking paths. The landscape and house combined bring together the best of Italian Renaissance along with its Mediterranean Revival design. An abundance of world leaders have visited this stunning property from Pope John Paul II to Queen Elizabeth to President Clinton and Ronald Reagan. You can combine a visit to the Vizcaya Palace Museum and Gardens with shopping in Coconut Grove, the Barnacle State Historic Park as well as the Miami Museum of Science and Planetarium. When the family is interested in learning about the thriving Latin culture that lives in Miami, then the best thing to do in Miami with kids is to take a trip to Little Havana. Your family will be pleased with the variety of cultural events that take place every day in Little Havana that reveal the Latin culture which has become synonymous with the city of Miami. Along Calle Ocho you will find a mixture of art murals, unique art galleries, South American restaurants and numerous storefronts selling everything. You can watch people roll cigars, play dominoes and of course dance to the many sounds that permeate from the storefronts as well as the smell of Cuban coffee in the air. While you are strolling down Calle Ocho you can spend time in the Bay of Pigs Museum and Library which will help explain that crucial moment in Cuba that has defined its history for decades. Little Havana is a perfect way to spend an enjoyable day or evening while your family learns more about the vibrant Latin culture that exists in the area. Photo by Maya83 on Flick. When you are ready to go sightseeing on land and sea but don't want to change vehicles, then the best thing to do in Miami with kids is to take a Miami Duck tour. 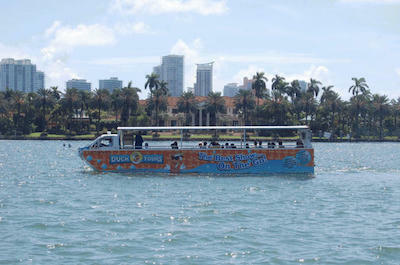 Your 90-minute excursion has several convenient departure times throughout the day ad begins when you board your unique amphibious Duck vehicle at Miami Beach. While you are riding in your Duck, your expert tour guide will inform you of all the exciting places you will be passing. You will cruise down Ocean Drive while viewing the incredible Art Deco Historic District including the Versace Mansion. You will cruise down Collins Avenue as well as Washington Avenue and you will be happy with all of the eclectic people you can watch. You will be thrilled as you pass Lummus Park Beach on your way to viewing the open pedestrian Lincoln Road Mall as well as the cultural aspects of Espanola Way. Once you reach the shoreline of the Biscayne Bay you will just continue cruising on the water where you will sail by Star, Palm and Hibiscus Island before your tours concludes at your starting point in Miami Beach. 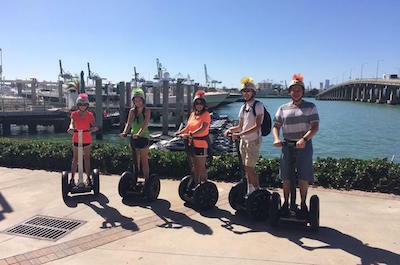 A great thing to do in Miami with kids that are over 12 years of age is to go on a Miami Segway tour. Segway tours are perfect for families that like to spend time together exploring the city and learning interesting facts about places that you are visiting. You will be amazed at the diversity of excursions that range from a ride down Collins Avenue and Ocean Drive where you can view the gorgeous Art Deco Historic District to downtown Miami and the Venetian Islands to a peaceful glide along Biscayne Bay while you view an incredible Miami sunset. Segway excursions can be arranged for two to four hours which allows for plenty of time for you to soak up the sun on South Beach. So when your legs have had enough and you want a carefree way of sightseeing then try one of these tours with your family. When your family is ready to combine a little adrenaline with sightseeing, then the perfect thing to do in Miami with kids is to try the speedboat and sightseeing tour. Your 45-minute excursion has numerous departure times throughout the day and begins when you meet the captain at the Bayside Marketplace. From here you need to get ready for a thrilling ride in the fashion of a Miami Vice speedboat chase on Biscayne Bay. As our boat enters the bay you will pass by such landmarks as Flagler Monument Island and the U.S. Coast Guard Station. After a quick acceleration by the boat that will get your blood flowing you will have a chance to view the Millionaire's Row of homes along Star Island and the Venetian Islands. As you pass by these islands your captain will give an interesting narrative about the history of Miami as you continue pass Fisher Island as well as South Pointe Park. You will speed into the Atlantic Ocean and cruise at high speed past South Beach where you can catch a glimpse of all the beautiful Art Deco buildings before returning through Fisherman's Channel where your excursion concludes. If your family likes to visit places that have many activities onsite including viewing a horse show, then an ideal thing to do in Miami with kids is to plan a trip to Tropical Park. Located at the intersection of Palmetto Expressway and Bird Road in south Miami, Tropical Park is situated in an urban wonderland of 275-acres on the site of the former Tropical Park Race Track. 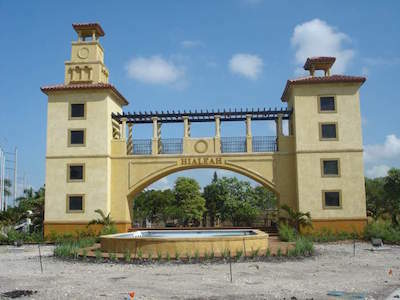 Tropical Park boasts a plethora of activities within the grounds that include playing fields for football, softball, soccer and several sporting courts for basketball as well as volleyball. The grounds also contain tennis courts, racquetball facilities, a boxing center and a fitness center. There are numerous miles of paved service for joggers, runners and bicyclists. In addition there are four lakes which offer everything from paddleboats to freshwater fishing and there is a separate dog park for four legged friends. The main attraction at Tropical Park is the Ronald Reagan Equestrian Center which hosts over 30 horse shows yearly within its three arenas as well as two grass courses. The Ronald Reagan Equestrian Center hosts several rodeos throughout the year which can bring in as many as 5,000 spectators to the grounds. Photo by Murray Foubister on Flickr. When you are ready to enter a cage and watch the monkeys run wild in their habitat, then the best thing to do in Miami with kids is to visit the Monkey Jungle. Located along Southwest 216th Avenue in southwest Miami Dade County, the Monkey Jungle is situated on 30-acres of tropical landscape that house hundreds of species of moneys from around the world. Your family will be thrilled walking the grounds at Monkey Jungle where you actually caged and the monkeys play freely in a habitat that is suited for them. You can witness a Java Macaque dive into a natural pool of water for food, watch orangutans play with their trainer and you will be amazed with the interaction of the great silverbacks of Cameroon with people. Other experiences include walking through Amazonian rainforest area that contains hundreds of plants as well as animals from South American and you can view hundreds of birds within the free-flight geodesic domes. Another interesting point about Monkey Jungle is the abundance of fossils that have been found onsite and are now on display. When your family wants a hands-on experience with rescued, re-homes and rehabilitated animals from around the world, then an ideal thing to do in Miami with kids is to take a trip to the Safari Edventure. Located along Southwest 142nd Avenue is southwest Miami Dade County, the Safari Edventure is situated on 5-acres of tropical landscape and is home to over 200 species of wildlife from around the globe. The Safari Edventure offers plenty of activities for families who like to learn about how to rescue, re-house and rehabilitate animals. The Safari Edventure is home to incredible animals such as emus, Artic wolves, several snakes and lizards, Mata Mata, lemurs as well as armadillos and alligators. The grounds also contain over 100 native and exotic trees which offer shade as well as habitat shelter for the animals. You can also take a stroll through the humming bird and butterfly gardens which house hundreds of unique species of humming birds and butterflies. There is an organic herb garden that is home to spices, medicinal plants and vegetables. The educational programs available at Safari Edventure are superb for foresting the future of conservation with yourself and your children. If you want your family to view hundreds of species of exotic animals from around the world in a unique atmosphere then the perfect thing to do in Miami with kids is to visit the Zoological Wildlife Foundation. Located along Southwest 172nd Avenue in south Miami, the Zoological Wildlife Foundation is situated on 5-acres of lush tropical landscape which offers a home to over 30 endangered and threatened species from around the world that include birds, felines, mammals, primates and reptiles. You will have the opportunity to take photographs of such animals as a Fence Fox, Clouded Leopard, Royal White Bengal Tiger as well as Amur Leopard. Your family will be thrilled with taking a guided walk through the grounds while viewing these majestic animals that also include species such as a Burmese Python, a Brazilian Three-Banded Armadillo and a Celebes Macaque. There are also several domesticated farm animals like goats, cows and chickens that roam the landscape. The Zoological Wildlife Foundation has several interactive tours that will put your children in the middle of a great learning experience and foster the need for future generations to continue the work of conserving our natural wonders of the world. When you want to take the family for an outdoor adventure that includes a farm and horseback riding, then the perfect thing to do in Miami with kids is to visit the Jesse Williams Ranch. Located on Southwest 123rd Avenue within Kendal Lakes, the Jesse Williams Ranch is situated in the heart of Miami's horse country and is complete with a working a farm. Your family can experience a wide range of fantastic activities while visiting the ranch including horseback riding as well as exploring a working farm. The Jesse Williams Ranch has 40 horses which are stabled onsite and offers a variety of horse training courses for various competitions. The ranch holds several workshops for families that allows for kids to get their hands dirty on the farm while experiencing the everyday life of a farmer. In addition to the horses the ranch has several farm animals that children can interact with such as goats, cows and there even a few exotic monkeys. The Jesse Williams ranch is home to several Osceola Florida Panthers as well as a large flock of Pink Flamingoes which the ranch will rent out to filming crews or for parties.